Single Coil, based on 1960’s J style bass pickups. Wound slightly hotter for more output and more low end. Sets are reverse wound for hum canceling in middle position. 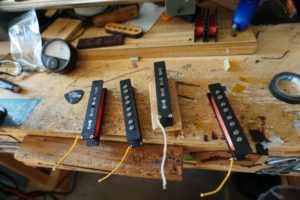 Dual coil, hum canceling j style pickups. Quiet, and wound slightly hotter for more output and more low end.